Saturn Run by John Sandford, and Ctein is a recommended political thriller in a sci-fi setting. It is 2066 and a spaceship is detected by Saturn. Obviously, there are many government meetings and President Amanda Santeros wants to send a mission there to investigate, and, hopefully, capture the technology. In a plan to keep the Chinese from knowing, only a few members of the mission are really told where they are going and why - in the ship named the Richard M. Nixon. The Chinese discover the real reason for the US launch and they plan their own, competing mission to Saturn. Despite an exciting premise and the fact that I enjoy science fiction, I really found it a challenge to get into this novel. There is plenty of technical science for those of us who like some science with our science fiction, but in this case it felt more like information dumps rather than science included in the fictional story. That combined with the abundance of international intrigue and espionage and characters I didn't really care for. I'm not disappointed that I read it, but it did seem to be bogged down in details with little plot advancement. 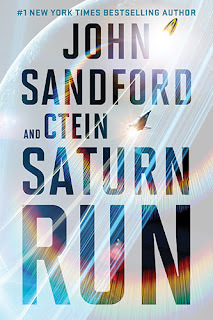 The three stars are because it is well written, but it suffered in comparison to the next sci-fi book I read which had a much more satisfying plot and better characters. Disclosure: My Kindle edition was courtesy of Penguin for review purposes.